William Grant & Sons UK has unveiled The Minisculinity Pack, featuring a 35cl bottle of Hendrick’s Gin and a book of 12 cocktail recipes. 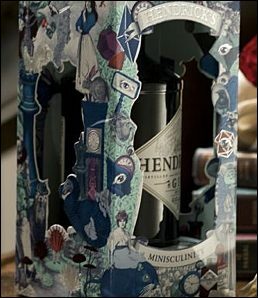 Presented in an eye-catching embossed box, the Hendrick’s Minisculinity Pack acts an introduction to Hendrick’s Gin. The new Hendrick’s 35cl Minisculinity Pack will be available from ASDA, Waitrose, Sainsbury’s and Selfridges from October at an RRP of £18.49. Hendrick’s super premium gin is made in Scotland and distilled in batches of 450 litres using a combination of a Carter-Head and copper pot still and an unique infusion of cucumber and rose petals.